What is Junior Tranche Debt? 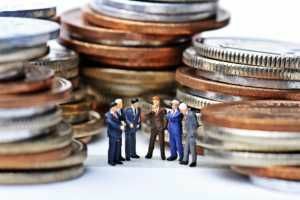 While senior debt is synonymous with corporations that avoid taking too many risks, junior tranche (debt) is common among the major shareholders of the company and parent companies. The parties are more familiar with the company and its operations and are therefore usually willing to accommodate greater levels of risk. Unlike outside investors, the shareholders maintain a close relationship with the company and may agree to take a reduced rate of returnExpected ReturnThe expected return on an investment is the expected value of the probability distribution of possible returns it can provide to investors. The return on the investment is an unknown variable that has different values associated with different probabilities. This guide provides the formula and examples for calculating on debt, a rate that is less than commensurate with the risk level, until the company returns to a sound financial position. When a company issues out debt, it may group it into either subordinated or unsubordinated debt. Unsubordinated debt holders rank higher in the hierarchy than the subordinated debt holders. If, for whatever reasons, the company is unable to meet its debt obligations, it may file for bankruptcyBankruptcyBankruptcy is the legal status of a human or a non-human entity (a firm or a government agency) that is unable to repay its outstanding debts to creditors. Generally, it is initiated by the debtor and imposed by a court in the bankruptcy court. If the court is satisfied with the request, it will appoint a liquidator who will sell the company’s assets and pay the creditors in order of priority. The first creditors to receive compensation will be the unsubordinated or senior debt holders. If there is excess cash remaining after the unsubordinated creditors have received payments, then the subordinated, or junior, debt holders are paid next. These creditors may receive the full debts owed by the company, or only a partial payment if the cash proceeds from the assets disposal were inadequate. Although junior debt holders are lower in the hierarchy than senior debt holders, they are paid before the shareholders. The shareholders will only receive payments if there are additional funds remaining after the subordinated and unsubordinated creditors have been paid in full. Due to the potential risk of default and loss of capital, junior debt holders should examine a company’s ability to meet its obligations. If after liquidating the company’s assets, there are inadequate resources to pay the senior debt holders, junior debt holders face the risk of losing their entire investment. Junior debt holders should review the total assets owned by the company, other pending debts, and the company’s ability to pay back its creditors before deciding whether to lend or not. For a risk-averse investor, it is more advantageous to own a claim on the senior debt than on the subordinated debt. On the balance sheetBalance SheetThe balance sheet is one of the three fundamental financial statements. These statements are key to both financial modeling and accounting. The balance sheet displays the company’s total assets, and how these assets are financed, through either debt or equity. Assets = Liabilities + Equity, a company’s assets are listed first, followed by liabilities and, lastly, shareholder’s equity. Since junior debt is borrowed money, it is recorded in the liabilities section. Current liabilities are recorded first in the liabilities section, followed by long-term liabilities. Senior debt is recorded first in the long-term liabilities section, followed by junior debt. Long-term liabilities are recorded in the order of priority, starting with the item to be paid first in the event of a liquidation. When a company sells bonds that are subordinated debt, the cash proceeds are recorded in the cash account, and if the borrowed funds were used to buy property or equipment, then it is recorded as property, plant, and equipment in the assets section. The more senior a debt is, the earlier it will be due for repayment. Senior debtSenior DebtSenior Debt or a Senior Note is money owed by a company that has first claims on a company’s cash flows. It is more secure than any other debt such as subordinated debt (also known as junior debt) because senior debt is usually collateralized by assets. This means the lender is granted a first lien claim lenders typically receive the principal plus interest payments earlier than junior debt lenders. For example, in European leveraged financing, senior debts typically offer repayment periods of 7 to 9 years while repayments of junior debts extend to more than ten years. Debts that carry a higher risk of default usually provide a higher rate of return as a way of compensating for the greater risk involved. Junior debt holders typically receive higher interest payments than senior debt holders, because their investment is less secure. Senior debt holders may earn margins of between 225 to 325 basis points while junior debt holders earn margins of between 800 to 1000 points. Senior debt holders receive the lowest interest rate payments because they are given the priority during a liquidation order. Should the company default on its obligations, all monies collected from the sale of assets are first used to pay senior debt holders before paying other types of creditors. Senior and junior debt share the same security package and are given preference before ordinary shareholders receive their dues. Each of these debts will receive payments in order of priority from the cash proceeds of liquidated assets. The inter-creditor agreement between various creditors dictates who will be paid first. An inter-creditor agreement occurs when a creditor agrees to subordinate itself to another creditor during the payments of principal. In normal circumstances, senior debt receives payments first, followed by the junior debt and other creditors. Junior tranches are used as part of debt securitization in the issue of collateralized mortgage obligations, collateralized debt obligations (CDO), or asset-backed securities. Although companies prefer not to issue junior debt, due to the higher interest rates, it may be considered a better option than issuing new shares to the public that may dilute the ownership of the company. Junior debt can be issued to finance acquisitions, to fund recapitalization or leveraged buyouts, or to provide growth capital. Subordinated debt may be combined with preferred stock to create a hybrid security that pays a dividend to the holder and is funded as interest expense by the issuer.